The Rev. Prince Rivers has been senior pastor of United Metropolitan Missionary Baptist Church in Winston-Salem, N.C., since 2005, and served previously at congregations in North Carolina and Virginia. 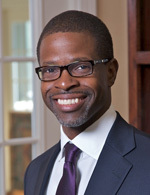 He has been a participant in the Pastor-Theologian Program at the Center of Theological Inquiry in Princeton, N.J., and serves on the Board of Visitors of Duke Divinity School and Winston-Salem State University. He has a B.A. in psychology from Morehouse College and an M.Div. from Duke Divinity School. Prince Raney Rivers: Church as business? Prince Raney Rivers: Why are we planning instead of ministering? Prince Raney Rivers: What makes pastors thrive? Prince Raney Rivers: What comes after "contemporary" worship? The return of "traditional"
Prince Raney Rivers: Leadership is not conquest. It is helping another to achieve. Prince Raney Rivers: Church discipline?